Matt it will be.interesting to see how the kits compare. 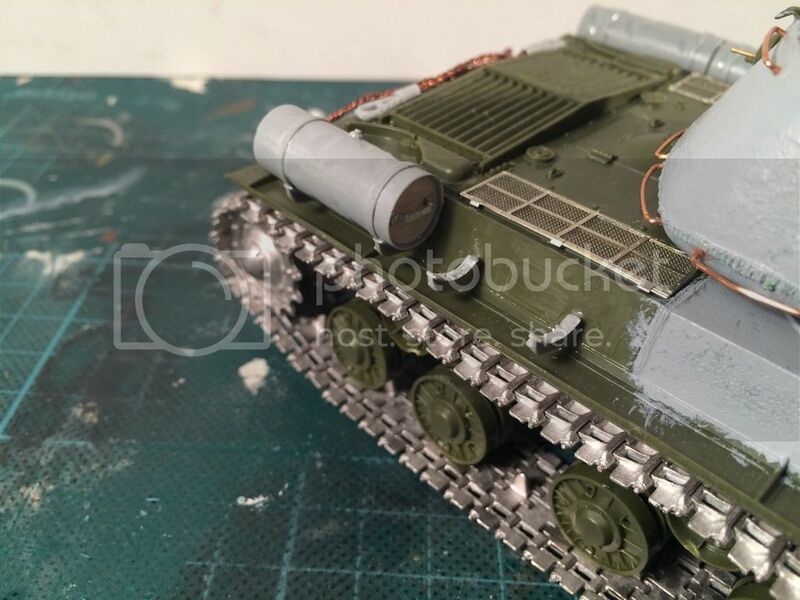 I have done a bit more work added some weld seams and road wheel arms. 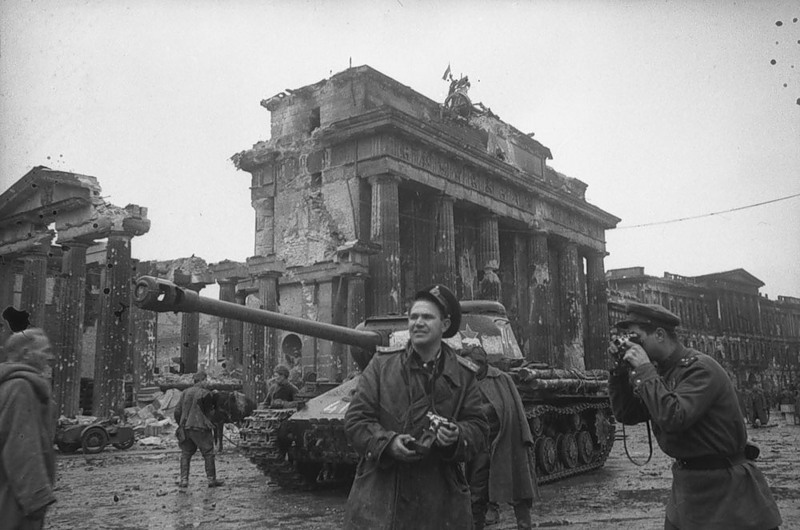 I have been consulting my limited sources on the IS2 and most of the combat pictures show them without fuel drums, especially the Berlin pictures. 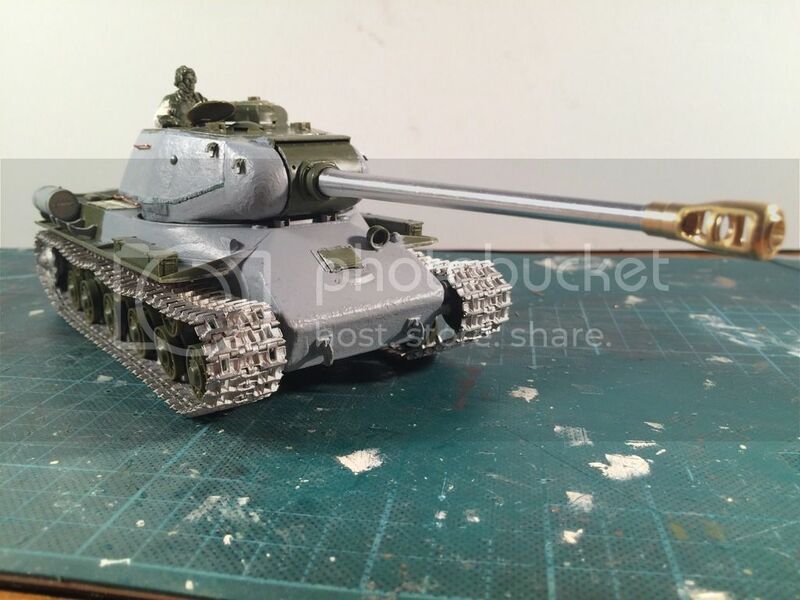 I was thinking about doing a Berlin tank. The question is to drum or not to drum. 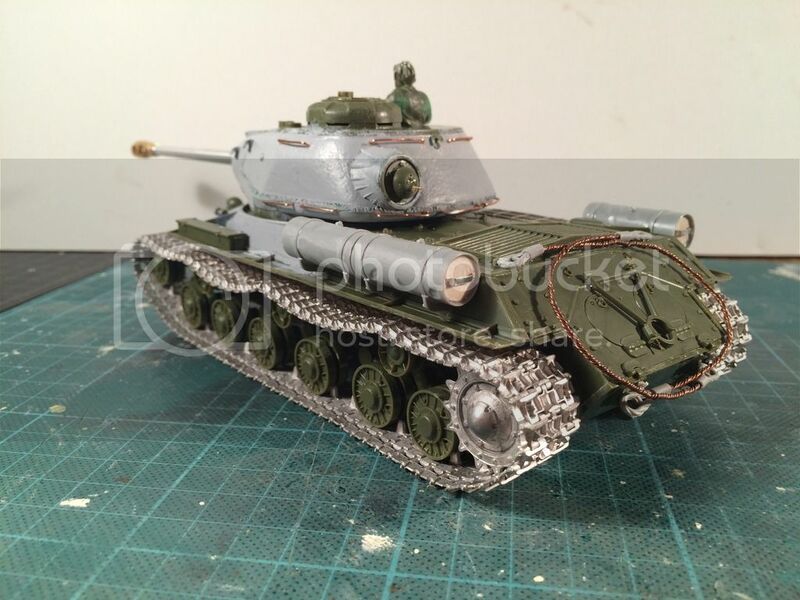 I am also tempted to use Polish markings, would it be a breach of rules to do a Russian allie? I'll have to ask again... are what-if builds allowed as long as they fulfill the weight and origin criteria? 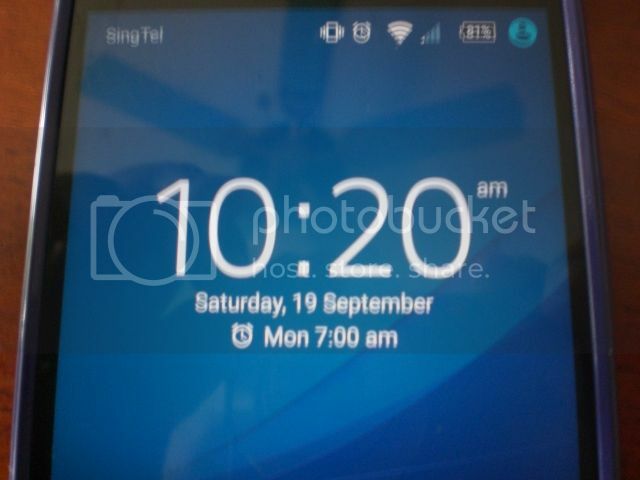 The pictures I have seen are by no means conclusive and covers every JS2. You have done a great job on your fuel tanks and I just started mine. I also saw some JS2s with all the fenders trashed. They may have dropped them to avoid getting the all shot up. Do what's best for you. If you don't have conclusive proof its up to you. It's looking good so far. I said in the campaign proposal that "Entries must have at least been proposed by the country's military. No what ifs allowed." Curses! So 414 didn't have fuel drums in Berlin. It had extra log protection / ditching beams. 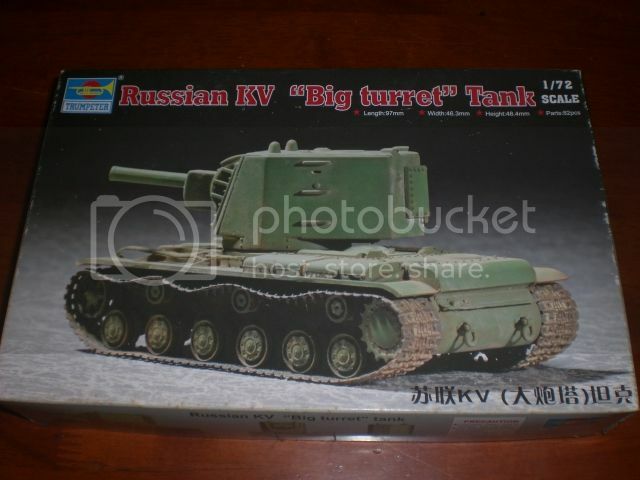 But wait a second, could that be tank 413?! ... A completely different fish to 414?! Looks like 414. So yours would be a week before Berlin. Thanks for the clarification,Timothy! Must have overseen that. I'll have to see if I'll be joining then as I had a specific combination in mind that I'd like to build soon. The Friulmodel tracks are complete. 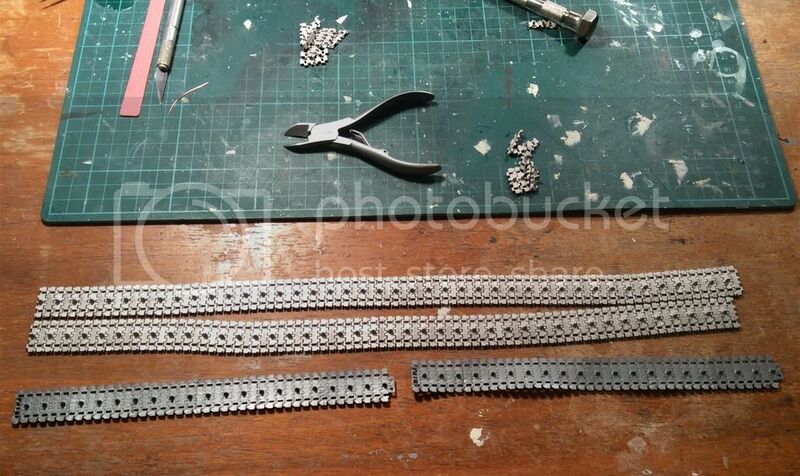 I've included the naff Zvezda tracks in the photo for comparison. They really don't compare. Next up, primer, then paint. Hmmm. Looks like I've put the tracks on the wrong way round. 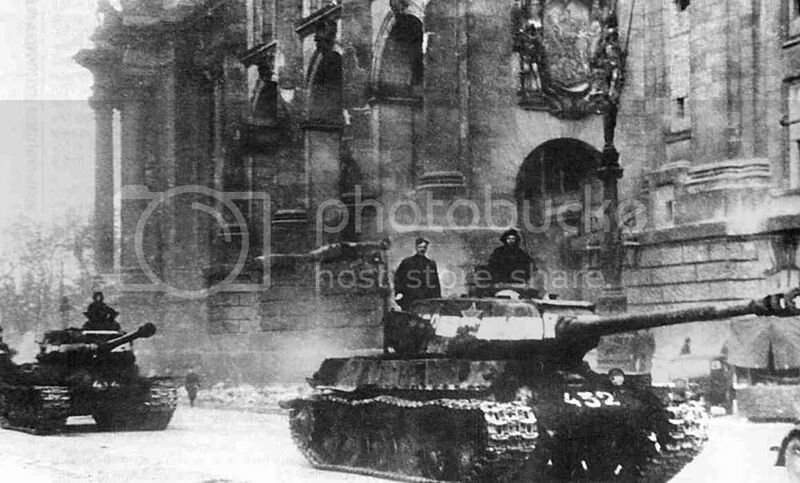 I am submitting my JS-3 Initial production seen at the Berlin Victory Parade. Some great builds already. I have just signed up. 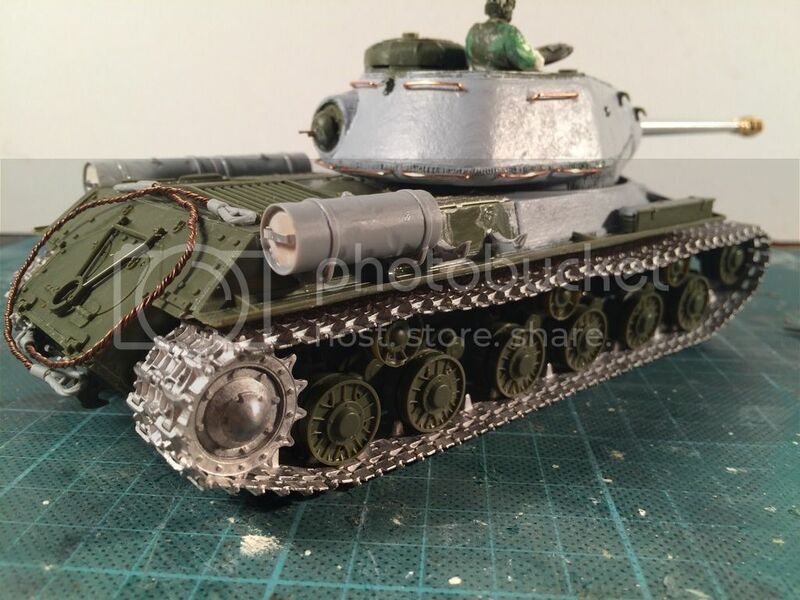 I am doing the Dragon 1/35 IS-2. 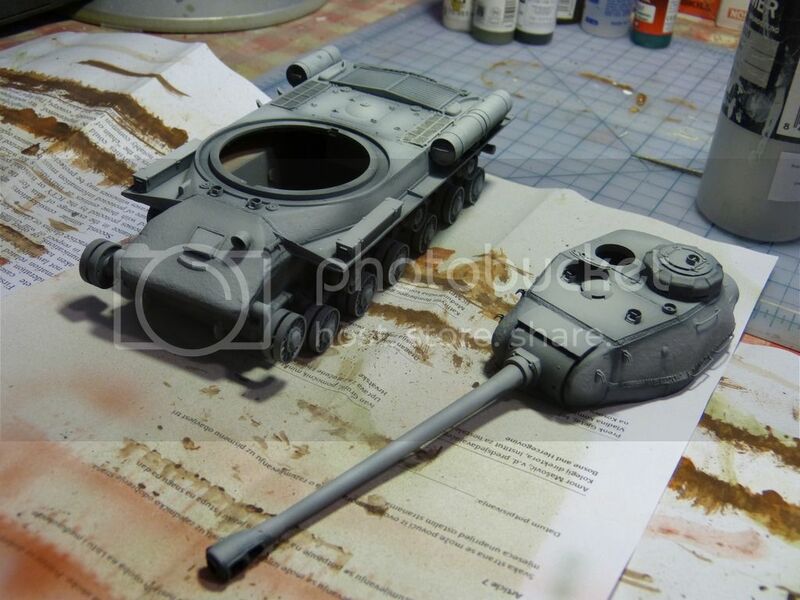 Slow progress on my IS 2. I joined the upper hull I will have to figure an a marking option before I go much further. I think about signing in here with an Azerbaijan T-72 AV. 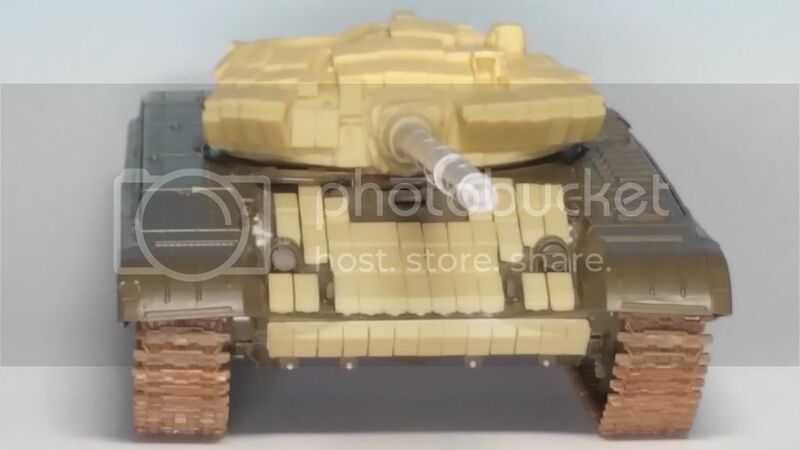 "Normal" T-72 have 41.500 kg combat weight but I guess all the ERA blocks fixed at these AV tanks will raise the combat weight over those magic 42.000 kilo of this campaign? Until now I wasn´t able to find out the real weight of this specific type. Second point is I have no clue if the Soviet Union / Russia fielded this specific type or not. This is my first campaign entry at all and I chose a T-72 AV. I´m not sure at this moment at which colors I will finish him but I have Azerbaidjan or Kenya in my mind. I did shaved off the frontal applique armor plate as it won´t be needed for this variant. Drive sprockets, idler and roadwheels are finished now. 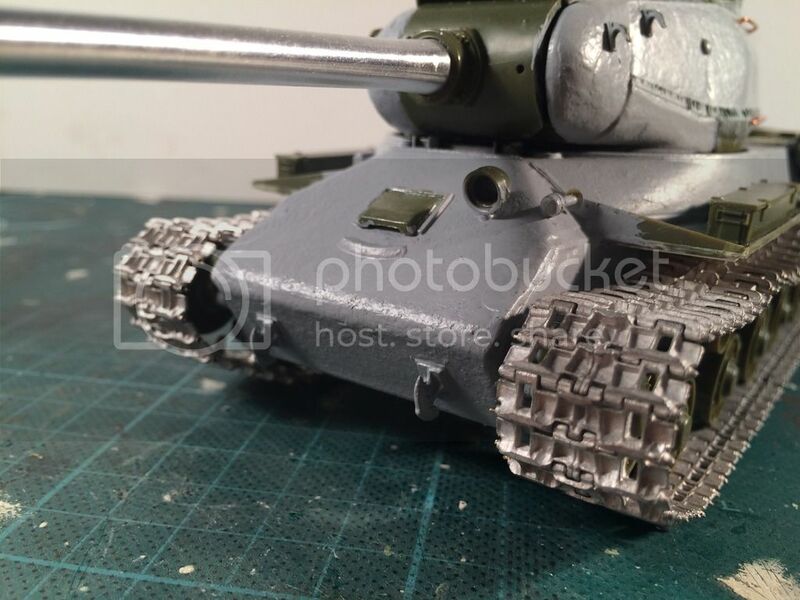 According to Tamiya´s construction manual there is now the frontal lower hull plate to glue but I ommitted that because I will use the folded out scraper blade from Chesapeake. But because of some very delicate parts I will do this at a very late stage during my build. 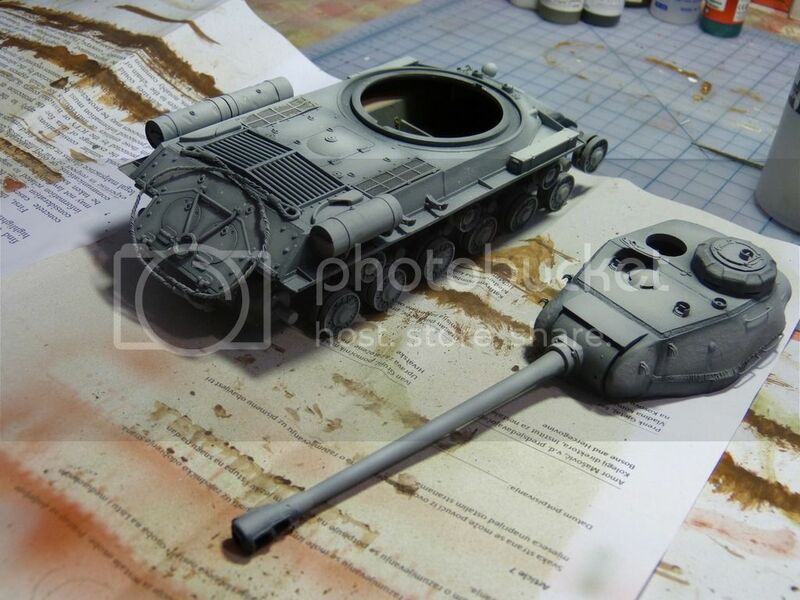 I will be changing the climbing brackets on the turret which are molded solid on the kit. 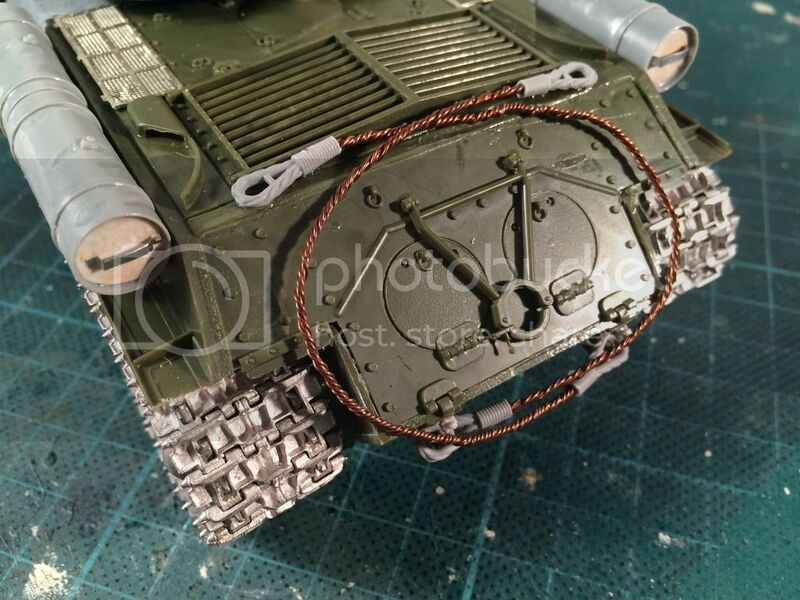 Will be using 0.5mm solid wires to scratch-build the climbing brackets... And stranded copper electrical wires for the towing cables, to replace the kit-supplied towing cables, which are molded in the vinyl-like material. 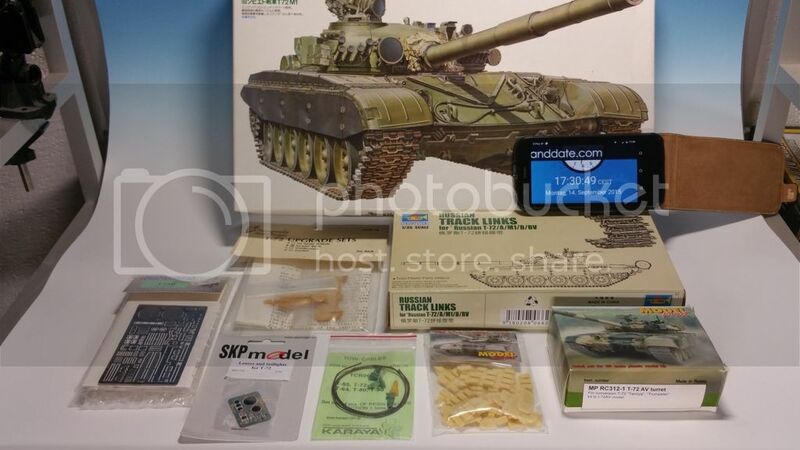 this is my weekly update: I´ve installed TRUMPETERS single link tracks on the tank. I did read a review report here that these tracks have connector pins for easy assembly... well my set dont have them and I needed to glue everything in place. Will be a bit more difficult to paint it all later. 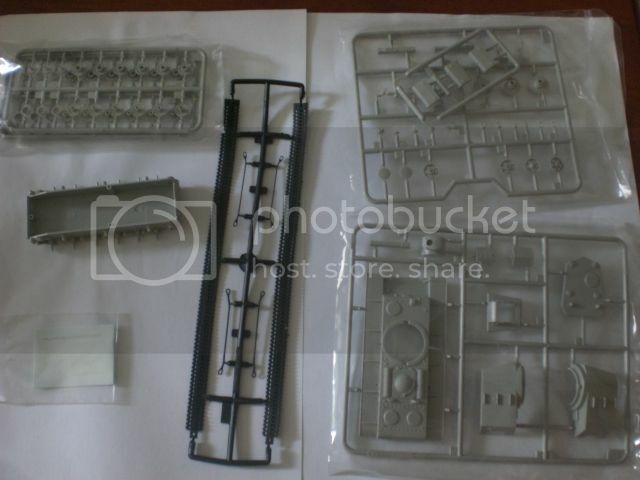 But it looks a lot more better than TAMIYA´s old vinyltracks. Next weekly update from my side: Sorry but this week there was not much spare time for modelling. 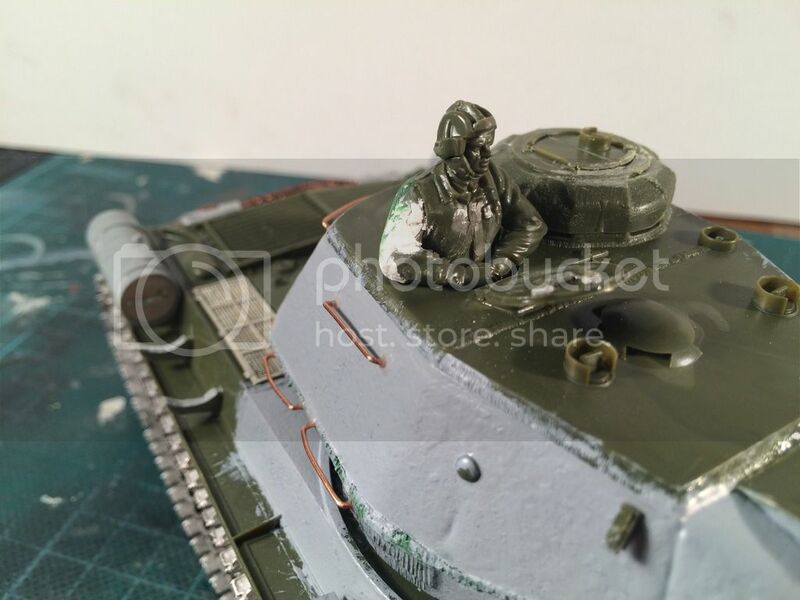 I just finished building the tanks hull, closing the holes at the frontal upper armor plate with putty and started to install the ERA-blocks. The frontal blocks are finished now and I have to turn my attention for the side ones. 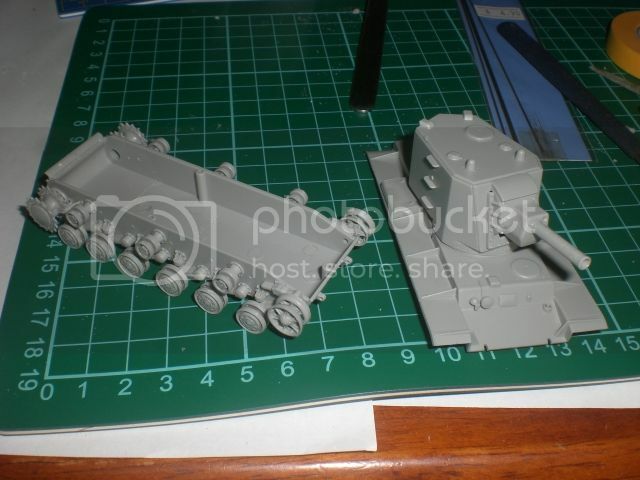 As I plan to do an Azerbaidjanian vehicle I have to work according to the few fotos I have and the attachment of these ERA-blocks are a bit different to MODELPOINT´s construction plan. 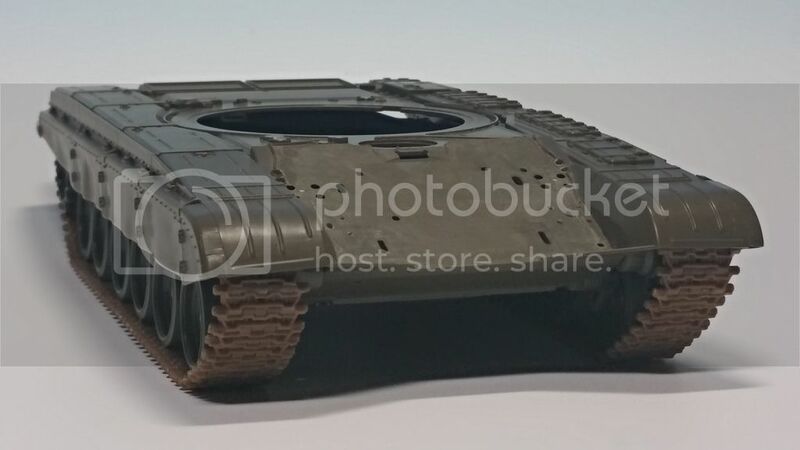 I also can see from the photos that these blocks (at least the upper hull ones) have been attached with some distance pieces, not flat onto the tanks armor. Therefore I used my trusted Punch and Die set and made quite a lot spacers to let it look realistic. I´m satisfied with the results until now. What do you think? 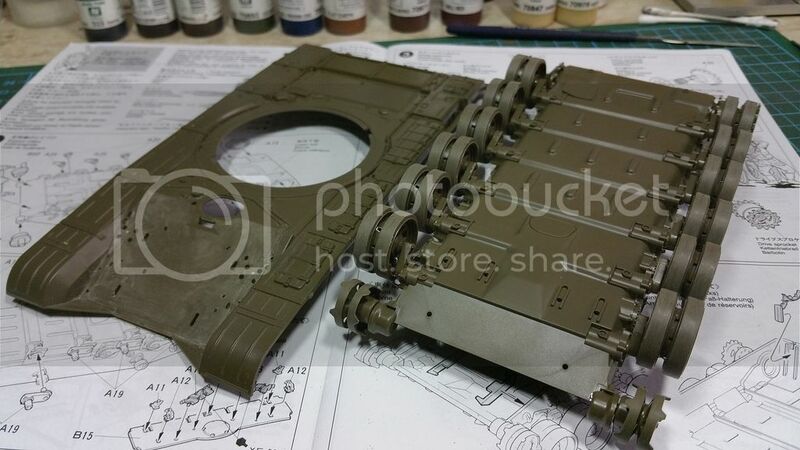 @ Thomas: I really like the ERA blocks on your Tamiya T72. Looks great! I will post an update on my JS2 later this evening. Not much progress, but it is now green at least. I'll post more photos individually, as soon as I'm back from holiday.